Hostinger provides out of the box email service with unlimited email accounts for Premium and Business plans. But what if you have VPS and don’t what to spend your time on email server configuration and maintenance or want to use third-party email provider for your web application? This is where Zoho earn their bread and butter. They give you access to your own mail server, without all the fuss associated with it. Zoho Mail is one of the more popular choices on the market when it comes to third-party mail services. This is due to a couple of reasons: it comes with a clean and minimalistic user interface, and it is completely ad-free. 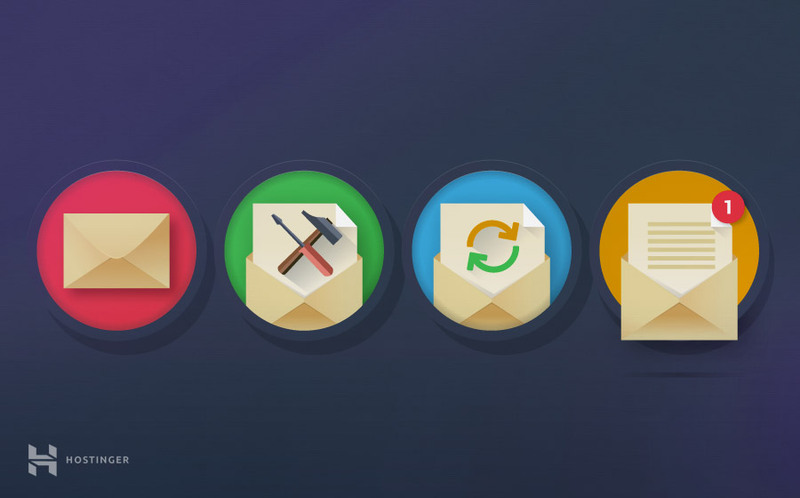 While most other services charge for hosting mail servers, Zoho Mail has a free version which you could use just to get a taste of what’s inside. In this tutorial, we will be using free version of Zoho Mail to setup a mail server for your custom domain name. The free version supports up to 25 users, with a 5GB limit on each user. Also, you are allowed to use only a single domain name with this version of Zoho Mail. For our purposes, this will suffice. To follow this tutorial, you are required to have a custom domain name ready to use. We are assuming that your domain name is managed by the Hostinger DNS. If you have a domain name not associated with Hostinger, you can use this guide to find out how to point it to Hostinger. Visit the Zoho Mail Pricing webpage, where it lists all the different packages along with their features and costs. Choose the Free option, which should be first from the left. Click on the Sign Up button. You will be taken to a new screen, where you will have to fill out the sign-up form. Here, you will be given the option to use a domain name you already own or purchase a new one from Zoho Mail. We will go with the first option. In the space provided below, enter your custom domain name, just in front of where ‘www’ is written. Enter your first and last name in the respective fields. In the Administrator Account field, enter the username you desire for your account. This will, as indicated, be the account of the system admin of this domain. Enter a valid mobile phone number in the field below, and make sure you have the phone with that number on you. You will see why this is important in just a moment. Choose a preferably strong password for your account. You will now receive an SMS on your phone with a verification number. Enter that verification number in the field titled Enter Verification Code. Once entered, click Verify Code. And that’s it! You have successfully created a free account on Zoho Mail. Now that our Zoho Mail account has been registered, we can move forward to the next step. 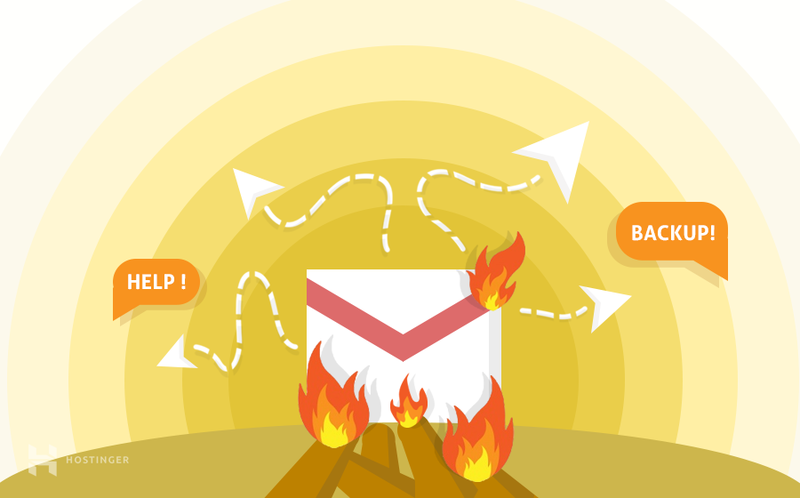 Before we can start sending and receiving emails via Zoho Mail, we need to take care of some settings. We have to configure our account correctly so that we don’t face any trouble down the line. 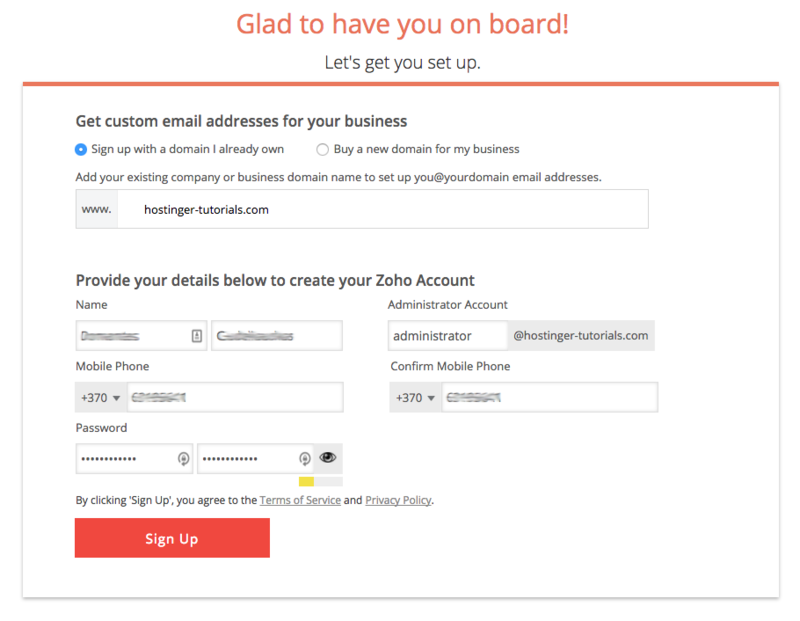 Zoho Mail requires you to verify the domain name you just entered on the Sign Up page. You are given three methods of doing so: CNAME method, TXT method, and HTML method. Go over to the Domain Setup page of your Zoho Mail account. You should see two fields titled Name/Host/Alias/CNAME and Value/Points To/Destination respectively. Let’s call them CNAME and Destination for convenience. Zoho has already filled these fields with values. You need these values to proceed further. Now, jump over to Hostinger’s control panel and open DNS zone editor tool. Now, you need to create a new CNAME entry for verification. Simply click on Add New to create a new record. You need to paste the CNAME provided by Zoho into the Host field and paste the address from Destination into the Points to field. 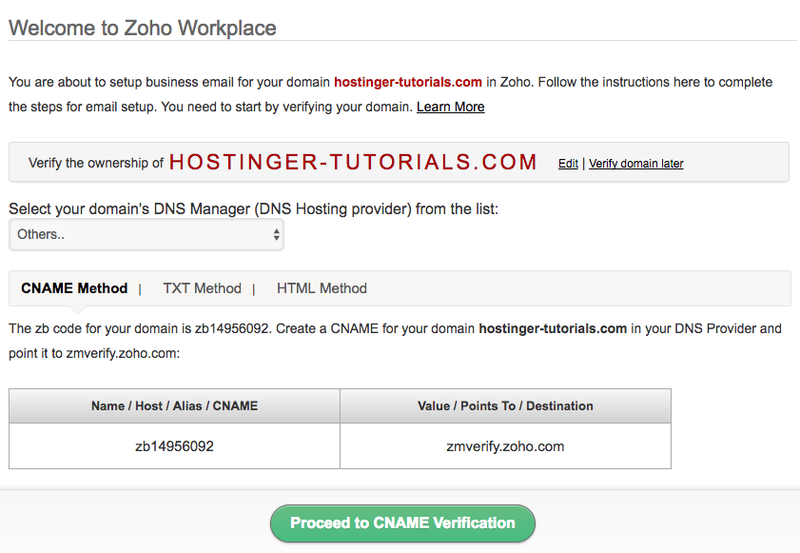 Hop back over to your Zoho mail account and click Proceed With CNAME Verification. And with that, verification of your custom domain name is complete. You should now have the ability to add users to your mail service. You can choose to go with Proceed to Add Users, but for this tutorial, we only need one user. So, we will choose Next and move along with the setup. Similarly, you can create groups right away with Proceed to Create Groups, but we will also be skipping this step. The final step in configuring Zoho Mail is the addition of MX records in you DNS manager. This will be similar to how you created a CNAME record for domain verification in Step 2.1. You can also add SPF record which helps to prevent email spoofing. Instructions how to do this can be found here. We can finally move on to utilizing the power of Zoho Mail. Achieving this is a twofold process: you need to create a new user associated with Zoho mail server and tweak some SMTP settings to make it viable. This is different from the user we created when we were signing up for Zoho Mail. While that was the administrator account used to manage Zoho Mail, this new user will serve as the target address for anyone sending emails to your custom domain. Go to the Zoho Mail Control Panel webpage. If you’ve been following this tutorial in one sitting, you should already be signed in as administrator. If not, login using the administrator credentials. Once logged in, select the User Detail option in the menu and select Add User. You will be presented with a form. Enter the first and last name you desire for this user. For this tutorial, we will be using ‘John’ as the first name, and ‘Doe’ as the last name. The important part here is the Email ID. This is where emails will be directed once this user has been created. For this tutorial, we will go with the name ‘johndoe’. Finally, enter a password for this user. Note to remember or write down all the details of this user, including all the above information. You will need this shortly afterward. Click OK to create this user. Now that Zoho Mail has created a new mail ID for your application, you need to configure your email client’s or application’s SMTP settings to allow it to use said mail ID. If you want to use Zoho with your web application, for example, WordPress, check out this tutorial. If you want to use Zoho with a traditional email client like Outlook, check this tutorial. Email Password – The password you entered for user John Doe in the previous step. Use SSL Encryption – This will enable SSL security to your emails. Enable it for a safer experience. SMTP Authentication – This is another setting that you should enable for better authentication. Once all these settings have been configured, your application/email client should be ready to send/receive emails using Zoho. You can now test your Zoho Mail service by using the Zoho Mail App. You can even add more users or create groups if you haven’t already.